In addition to brushing twice and day and flossing once a day, seeing your dentist regularly is important for maintaining oral health and preventing gum disease and cavities. For most patients, it is recommended to get a dental checkup and cleaning every six months, but your dentist may recommend fewer or more frequent visits, depending on your oral health. A dental cleaning (also called a dental prophylaxis), is more than “just cleaning your teeth.” During the dental cleaning, the dental professional will remove plaque and any tartar (hard, calcified deposit) that has built up on your teeth. Tartar can host a number of bacteria that can cause inflammation and breakdown of bone and gum tissue supporting the teeth. When this tartar is below the gum line in deep and infected pockets, it requires extensive treatment to remove the tartar and bacteria. This is one reason why regular dental cleanings are so important—to prevent the development of gum diseases. Frequent dental cleanings are also recommended so that the health of the gums and teeth can properly be evaluated on a regular basis. If there are any oral health concerns that can be addressed or improvements that can be made to prevent gum disease or cavities, then these can be discussed during the dental cleaning visit. During the dental checkup, Dr. Street will evaluate the health of your teeth and x-rays may be taken in order to see the parts of the teeth that can’t be seen in the mouth. Dr. Street will discuss with you any signs of problems or concerns (such as cavities, gum disease, or even possible early signs of oral cancer) if present. Dr. Street and his staff firmly believe that any prevention of oral health problems is always better than having to treat them when they become issues. Additionally, most insurance plans cover 90-100% of any preventative treatment (examinations, cleanings, and x-rays), so it is financially beneficial for patients to use their benefits to prevent more extensive treatment in the future. (For children, insurance typically also covers other preventative services such as fluoride application treatments and sealants.) If you have any questions about the amount of insurance coverage of these preventive services, feel free to call our office at (918) 488-9770. Our goals for every patient are to help you achieve and maintain excellent oral health as well as address and provide solutions to any dental concerns or needs you may have. 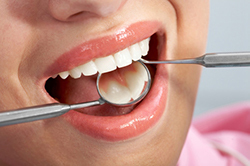 And coming in regularly for cleanings and checkups is a vital part of oral health maintenance. Dr. Scott Street and the team at T-Town Smiles provide quality dental care to the Tulsa residents. To schedule an appointment with your Tulsa dentist at T-Town Smiles call (918) 488-9770 today.